Pierre Jacquemon's Original Oil on Canvas, ABSTRACT Oil painting SIGNED. 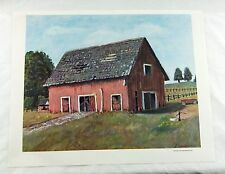 This is painting has been in our family for over 50 years. It is in very good condition. The paiinting measures 12" x 14" and a little more with frame. There are artist notes on back of the canvas. Should you have any questions, please let me know. BY WOLFGANG MUELLER OTTO. AFRICAN MAN PLAYING BONGO DRUM. The lithograph number is hard to read. LITHOGRAPH ON CANVAS. We try to treat everyone with courtesy, professionalism, and respect. There is a slight discoloration in the lower corners, but it does not affect the image or the publication information printed below the image. Tall VTG Floral Canvas ART Picture Framed ~ 10" x 23"
Vintage 1960's A.M. Machourek Bullfighter Vintage Print of Canvas 18"x24"
Vintage 1960's Garcia Boats Vintage Print of Canvas 18" x 24"
BY CHARLES COBELLE. 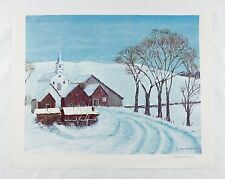 Artist's information quoted from Wiki site:Charles Cobelle, born Carl Edelman (1902–1994) was a modern French master of painting, lithography and a fine muralist, who was born in Alsace-Lorraine, France. I n g o o d condition. Eglise de Strins (Seine) Maurice Utrillo Mid Century Print on Canvas 21" x 25"
This print is referred to as both Eglise de Strins and Eglise de Stains. Strins = Stains. Eglise de Strins (Seine) Maurice Utrillo Print. Eglise de Stains (Seine). Hard to find print. RARE Beauty MCM 16X20 FISHING SAILBOAT Lithograph HARBOR Print CANVAS Retro NOS! FISHING SAILBOAT IN HARBOR. The lithograph number is hard to read. LITHOGRAPH ON CANVAS. The differences here, are that this one is printed on cloth canvas and it's basically "new". To God be the glory, forever and ever. His body of work reflects a continual evolution, a constant seeking of new arenas in which to play out his ideas - painting, drawing, collage, printmaking. As he masters each new technique, he incorporates it into his work to achieve his ultimate artistic goals: harmony and equilibrium. “Surrealismis destructive, but it destroys only what it considers to be shackles limiting our vision,” he said. “That of being Salvador Dali". The upper area of the painting, with the halo and brown clouds resembles photographs of atomic explosions. AFRICAN MAN PLAYING HARP. BY WOLFGANG MUELLER OTTO. The lithograph number is hard to read, but might be 0907-12. LITHOGRAPH ON CANVAS. The differences here, are that this one is printed on cloth canvas and it's basically "new". Detlefsen was a master of shadow, light and depth. This is photographed from various angles and various lighting sets, and so you get a great idea of how beautiful this piece truly looks, and IS.! This oil painting is an original. The still life is full of beautiful colors. Original woodcut, title: " After the Rain " plus 2 in. margins, edition 19/25, signed '60 and numbered in pencil. Original Oil On Canvas. Nautical / Seascape. Titled: Yankee Clipper ( on the rear ). Signed by the artist, BRUCE PATTERSON. Circa, 1940' or 50's is my guess. BRUCE PATTERSON. OIL ON CANVAS. CONDITION: The overall condition is good. The lithograph number is hard to read. One is the image of an African man playing an African harp and the the other is an African man playing an African bongo drum. BY WOLFGANG MUELLER OTTO. The differences here, are that this one is printed on cloth canvas and it's basically "new". Nice painting, children with flowers, black and white. So originally I thought this was an oil painting on canvas but I do think it's an oil print on canvas as evidenced by the coloring of back and sides. Very well done. 15" by 13". Joan Root’s art is Contemporary Classicism and representational. In May 2011, she had a one-person show at the Arts Club of Washington after more than twenty-five years exhibiting with the Franz Bader Gallery. Condition - have scratches, wears and paint loss, few rends on the canvas. 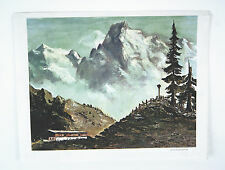 Vintage 1960's Frans Van Lamsweerde Greek Lithograph for Donald Art Co.
Frans van Lamsweerde (20 June 1920 - 25 September 1969). Frans van Lamsweerde worked at the Toonder and Geesink Studios in the 1940s. Among his work for Toonder was 'Pinneke Proost', an advertising comic for Kabouter-Jenever in cooperation with Hans G. Kresse, Cees van de Weert and Henk Kabos. BY RICHARD HINGER. SCREECH OWL. The lithograph number is hard to read. LITHOGRAPH ON CANVAS. The differences here, are that this one is printed on cloth canvas and it's basically "new". To God be the glory, forever and ever. MCM Rutan LITHOGRAPH 20x16 CANVAS Blue FLOWERS Red VASE Crisp Colors NOS Retro! The lithograph number is hard to read. That lithograph pictures white flowers in a blue vase. BY A. RUTAN. BLUE FLOWERS IN RED VASE. The differences here, are that this one is printed on cloth canvas and it's basically "new". The lithograph number is hard to read. That lithograph pictures blue flowers in a red vase. BY A. RUTAN. FLOWERS IN BLUE VASE. The differences here, are that this one is printed on cloth canvas and it's basically "new". BRANCHES IN TALL RED GLASS VASE. The differences here, are that this one is printed on cloth canvas and it's basically "new". We try to treat everyone with courtesy, professionalism, and respect. The painting is in a Plein Air style on a canvas board. Canvas Lithograph re-print, excellent condition, -Hand-cut, wood-framed. ‘Marriage License’ Norman Rockwell, Classic painting by the great American Author. You will LOVE it! EVENING SCENE. The differences here, are that this one is printed on cloth canvas and it's basically "new". We try to treat everyone with courtesy, professionalism, and respect. EVENING WAVES ON THE BEACH. The differences here, are that this one is printed on cloth canvas and it's basically "new". To God be the glory, forever and ever. The differences here, are that this one is printed on cloth canvas and it's basically "new". CLOUDS SUNSHINE AND BIG WAVES ON THE BEACH. The differences here, are that this one is printed on cloth canvas and it's basically "new". To God be the glory, forever and ever. Artist - Hazel R. Tripp - native of Capitola / Northern California. Title of painting : Sun Flower. Art work : 10.5" x 13.5". SEASCAPE / NAUTICAL. The lithograph number is hard to read. SAILBOAT IN HARBOR TOWN. The differences here, are that this one is printed on cloth canvas and it's basically "new". The lithograph number is hard to read. SAILBOATS IN VENICE CANAL. SEASCAPE / NAUTICAL. The differences here, are that this one is printed on cloth canvas and it's basically "new". (SIGNATURE IS NOT LEGIBLE). CONDITION - GOT PAINT LOSS, CRACKS, SPOTS, WEARS AND SCRATCHES. ROWBOAT IN A MOUNTAIN LAKE. WITH PINE TREES AT SUNSET. The differences here, are that this one is printed on cloth canvas and it's basically "new". We try to treat everyone with courtesy, professionalism, and respect. Vintage 1960's M. Gill Parisian Scene Vintage Print of Canvas 18" x 24"
Print of painting by artist Edna Vierra. Printed on canvas board. Hippie girl with a guitar and the traveling boy. The girl, on both sides of her head you will see the puncture marks. The boy has 1 puncture mark. Adorable Couple Big Eyes Boy and Girl. I believe this to be a print on canvas.